Musings on Markets: Facebook face plant: Time to friend the company? Facebook face plant: Time to friend the company? Facebook returned to the headlines on Friday, after it's stock price dropped below $20. At it's closing pricing of $19 on August 17, Facebook was trading at roughly half it's IPO offering price. Investors, analysts and journalists are all looking for the reason for the collapse and some at least seem to have found a ready target: the price drop, they argue, is the result of the "unlocking" of restrictions on insiders selling shares. The problem with this explanation is that it has never been a secret that insiders in Facebook would be able to sell shares starting August 16 and I would wager that no one would have even noticed the end of the lockup period, if the IPO had gone well and the stock were trading at $ 55/share. So, what is going on with Facebook? Why has its stock price plunged over the last few weeks? And is the stock cheap at $19? S1 Filing (February 2012): In my first post on Facebook this year, right after Facebook filed its financials (S1) with the SEC, I valued Facebook at $28/share (or $70 billion). I based this valuation on the company's immense potential (its vast user base and the information it had about these users), but was concerned about the absence of a clear business plan (to convert users to revenues), the overhang from insiders stockholdings/options (yes, you could see the lock up period ending in February) and the abysmal corporate governance. Playing the IPO pop game (February 2012): In response to a wave of articles that seemed to suggest that investing in the Facebook IPO (at the offering price) would be a sure road to profit, I tried to provide some history on the IPO game in my second post on Facebook, noting that while it was was true that investing in the average IPO does generate a pop for investors, this pop is not guaranteed and that the IPO game can be a loser's game. The day before the IPO (May 2012): On the day before the IPO, I posted on what I saw as the hubris of those involved in the IPO process - the investment bankers, the company (Facebook) itself and the institutional investors, who all seemed to think that they could lead the market by to wherever they wanted to go. I updated my valuation of Facebook to about $27 a share and contended that the stock would open with a relatively small pop (that the bankers would get the pricing right) but that the stock was overvalued for longer term investors. The post-IPO assessment (May 2012): The stock opened (late because of the NASDAQ technical problems) at about $42 and very quickly lost ground over the day to end the day at below the offering price. I posted my rationale for the momentum shift and argued that a great deal of the blame could be laid at the feet of the company and its bankers, who essentially took momentum for granted. I also ended the post by arguing that the switch in momentum could very well lead take the stock in the other direction, from over valued to under valued. 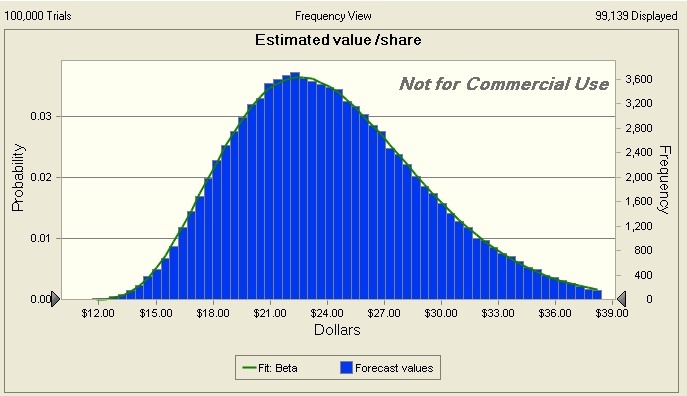 If Facebook was over valued at $38, relative to the estimated value of $27/share, is it under valued at $19? To address this question, I revisited my Facebook valuation from May and looked at what I have learned about the company (for the better or worse) since. Has there been enough information that has come out about the firm that could have caused the intrinsic value (at least as I measure it) to drop below $19? The biggest piece of financial information that has emerged on Facebook has been one quarterly earnings report a few weeks ago and it seems to me that not much has changed on either side of the ledger since February. The earnings report was a disappointment to markets, revealing less revenue growth than anticipated and an operating loss, largely as a result of share compensation expenses that were recognized when restricted stock units owned by employees were recognized at the time of the IPO. Facebook remains a company with vast potential (their user base has not shrunk), no clear business plan (is it going to be advertising, product sales or something else) and poor corporate governance. I had not expected any of these issues to be resolved in the one quarterly report and they were not. I did make some adjustments to my valuation: (a) lowering my revenue growth (with my 2022 revenue estimates dropping by about 10%, relative to my May estimates, (b) reducing the operating margin from 35% to 32% to reflect the higher expenses and (c) reducing my sales to capital ratio from 1.50 to 1.20 to incorporate the higher cost of acquisition driven growth. With these changes, my intrinsic value for Facebook with the updated information is $23.94, a drop of just over 10% from my May 2012 estimate. So, why did the price drop so much? There are several possible reasons. The first is that my estimate of intrinsic value is completely wrong, that the true value for the company has always been in the low teens and that the market is correcting its initial mistake. The second is that most investors in Facebook don't know what the value of the company is and don't care a hoot about it. Instead, they are pricing (rather than valuing) the stock, reacting to the "surprise" in each news story and to how other investors in the market are responding to that story. This, after all, is the nature of momentum investing, with positive surprises getting magnified by the crowd into unrealistic price jumps and the negative surprises into catastrophic drops. I know that analysts have turned bearish on the stock but since many of these analysts assured me that Facebook was a steal at $38/share, I am not inclined to put much weight on their prognostications. In fact, they very fact that they are turning against the stock may be a positive indicator. Now that the stock is at $19, about $5 below my estimate of intrinsic value, would I buy? To make that judgment, I considered three factors. 1. My value could be over stated: I understand that this is a risky investment and that my estimate of value could be hopelessly wrong. In fact, I followed up my intrinsic valuation with a simulation, where I looked at the distribution of intrinsic value, allowing revenue growth, margins and cost of capital to vary. Based on my assumptions, there is an 80% chance that the stock is under valued at $19 a share and an almost 85% chance that it is under valued at $18 a share. 2. Management is not going to change: The corporate governance issue is the one that I have the most trouble overcoming. The structure of the voting rights in the company ensure that there is little that stockholders can do to influence how this company is run and that can be a potential problem if it locks itself into a self-destructive path. Calling for Mark Zuckerberg to step down or share power, as an article in the Los Angeles times did, are completely unrealistic. The Russians have a better shot at getting rid of Vlad Putin than Facebook stockholders have of displacing Zuckerberg. For some, this may be a deal breaker, and it came close to being one for me. 3. Vindication, even if I am right, will not come quickly: Markets know no fury to match that of momentum investors scorned, and these investors tend to turn with a vengeance on the companies that disappoint them. Put in stark terms, it is entirely possible that my valuation of Facebook could be right but that the stock price could continue to keep dropping as investors bail out. Eventually, the "intrinsic" truths will emerge, but it may be a long time coming. My conclusion is that Facebook is not quite at the threshold of being a buy yet, but it is getting close. I have a limit buy order for the stock at a price of $18. I would be interested in seeing where you stand on the stock and you are welcome to enter your estimate of intrinsic value for the stock and your threshold for buying the stock in the shared Google spreadsheet. Why aren't you taking into consideration the number of shares available to buy when calculating the stock price? with so much shares coming of age soon, shouldn't that be a critical factor in the decision process? May I ask if the valuation uses an analysis of the statements to gather how much is being distilled correctly into the numbers ? There are no new shares being created. They are RSUs that are becoming unrestricted. I have counted those shares as shares outstanding. Are you asking about my spreadsheet? Or about valuation in general? If it is my spreadsheet, I use whatever revenue and operating income you enter. There is not anything else I can do. In valuation, in general, it is your job to assess the numbers. For instance, I did add back the abnormally high employee share issuance expenses from the last quarter since they reflected an abnormal adjustment at the time of the IPO. If you are willing to buy at $18, why not express that view through options? For example you can write $18 puts for November for $1.5, giving you 7.5% for three months for agreeing to buy the stock under $18, which you would likely do anyway. Your put strategy makes sense but it is risky in the following sense. You are assuming that my estimate of intrinsic value will not change if something catastrophic comes out about the firm. If that happens, my intrinsic value will collapse and I will have to come through on my side of the put transactions. So, I would rather sit and wait... And if the stock never touches $18, lots of other fish in the sea. 2. Rev growth assumption of 35% for next 5 years seems too optimistic. Already in Q2, rev growth slowed down sharply from 45% in Q1 to 32% in Q2. What's been the driver of rev growth until 2011? It's been user growth in the most lucrative markets (NorthAm, Europe). 3. A further headwind that hurts their ability to grow the rev, esp in NA and EU, is the shift in the user towards mobile devices where the ARPU is much lower. Given #2 and #3, my guess is, their rev growth will fall to 20% YoY in a matter of a few qtrs, unless they come up with a new, rapidly growing, rev stream. So the case for FB has to be built around how quickly they can grow ARPU - with existing businesses or new ones - to drive overall rev growth. If you make the above two adjustments (#shares, and adjusted, lower rev growth) what happens to your value estimates? You have a valid point about FB's user growth. In my view, unless there is a population explosion in Asia, African regions, and the little babies become FB users, the user base is not likely to grow by more than 10% per year. Of course, if Marsians (from Mars) get hooked on to FB, it will be a different game. I too have tried to create a DCF based valuation model of my own for Facebook, mainly for my own learning. My analysis indicates that the upper bound for Facebook's valuation is only about $60B. One main area of difference compared to your model is in the revenue build-up. Though, I have assumed aggressive MAU and ARPU growth. Could you please take a look at my analysis and help me improve it. Here's a link to my work. Rating Agencies have been rendered redundant! I would still go with your initial valuation of $27 in the long-term, market swings should not necessarily lead to a revaluation exercise. Great post as usual, but I think the diluted number of shares is around 2.74Bn...which will greatly effect the Target Price. Facebook is fairly valued at $8. Demand generation (AKA display ads) will never be a profitable business on the internet because there is an oversupply of inventory. When advertisers attempt to compare the ROI of demand generation advertising with demand-fulfillment (AKA search driven ads & commerce), they come up empty handed every time. Therefore, I believe that in the coming years Google, eBay, Amazon & Yelp where the user pulls what is of interest to them, will come to dominate. Yahoo, Facebook, Groupon and others who push things to the user will wither. first of all thanks a bunch for all the priceless information you collect, generate, and share on your homepage and blog. As regards facebook in general: I'm using it myself, although maybe on my mobile phone. And I'm already starting to be annoyed by just the few advertisements/recommendations there. As regards the facebook stock: there's several reasons why I'm not going to buy or short the stock or any kind of option on it. For once, as a user myself I'm quite sure any potential perception of the stock would be biased in some way (I would also never consider to actively invest into my local soccer team, were it ever to go public - save for maybe a couple of shares to claim myself part-owner of the club), which is aggravated by the stir this company and stock continues to cause. At the same time, the governance situation to me is a no-no, considering myself to be interested in investing only in the long-term. I'd be really interested to read your opinion on biases when valuing or investing in companies one's affiliated to (be it as a sports fan (owning a franchise's stock), Harley Davidson driver, Apple-holic, or even employee of a certain company) at some point in form of a blog post. I don't believe in today's world the share prices are decided on the basis of fundamentals. The strongest player or group of players on any exchange decide the price be it share, commodity or currency. The stock, commodity and currency exchanges have been reduced to gambling dens whereby the more powerful traders with deep pockets move the markets to maximize their own profits at the expense of the remaining not so powerful players. The big boys have enormous money power to move the markets in the direction which results in maximum profits for themselves. They effectively use the media to lure the other players in the market to a position where they would incur maximum loss. I suspect the snippet was chosen for propaganda value. The situations aren't comparable. You can always sell. It's quite a bit harder to emigrate from Russia. Do you think FB is idiosyncratic here or do you think this applies to several other social media companies as well? For example, GRPN is now at 4.5, which is much lower than the valuation you gave it a little while back. I know a lot has changed since then, including a surprising earnings report, but wondering if GRPN would be interesting as well. Do you suggest holding on to this stock if bought at $38? Or Should the investors sell if they are hoping for quick gain, not long term investment? Do we consider emotion's in valuation? I think many loved FB before IPO, now they love to hate. Change of emotions are so fast that loyalty to FB BRAND is in question. Which will have direct impact on FB stock price. If not that will have ? mark on every new product this company launches. very impressive blog. It discuss about the basic things about Link Building Company UK. Thanks for this blog. I found your website the other day and after reading a handful of posts, thought I would say thank you for all the great content. Keep it coming! I will try to stop by here more often. The article is well written and amazing post to read everytime. Thanks for sharing this info. btw ente tau gk yah arti agan?? In regards to just putting in a buy order @ $18, versus selling a put at $15 (which was suggested by someone else), I don't quite understand why selling the put would be any different than your buy order. I understand the potential change in intrinsic value, but couldn't this happen after your buy order is triggered? Unless I am misunderstanding something, I think that the way to protect against that possibility, while still keeping your buy order (as well as creating a position with better R/R parameters than simply selling the $15 put) would be to purchase a put along with your buy order. Maybe one could purchase one 16 strike put, set to trigger off of your $18 buy order being triggered. This way your downside is truly defined from the price of your share purchase ($18) down to the strike of the put ($16), minus the premium paid for the 16's. I ended up buying Jan-14 30 strikes myself, somewhere around $18.50 or so. Any comments on my ideas? ...".. lots of other fish in the sea"
When I see FB I see a young bright guy that created a platform that has become part of our culture . With a pool of more than half a billion of potential costumes. FB has more info about us than many governments in the world. A founder that has been mentored by some of the most experienced and bright guys in silicon valley. I'm a buyer around 20 bucks. I know this may not sound like fundamental analysis but I'm willing to risk some cash for a few years. I'm looking at the Professor's spreadsheet on FB's updated valuation and have several questions. 1. # of share outstanding - why adds 403 and where does this number come from ? 2. Operating income - where does the number 1209 comes from ? 3. Avg. maturity for stock option - I don't understand why it's 2.04. It shows 4.08 on the 10Q. Is it 4.08/2 but why ? hello! very impressive blog. It discuss about the basic things about Link Building Company UK. Thanks for this blog. Even though the stock of facebook has recovered from a low in the high teens its currently trading around 28 I am still unimpressed with the company. I would say the best way to describe facebook would be its a very bad imitation of google or apple. Facebook has made one mistake after another the thing about the stock is its so very dependent on the under twentyfive market for its success. Thanks for sharing the article on your Facebook valuation. Very informative. I have two main reservations about Facebook that would prevent me from being long the FB "stock" from the perspective of a long-term investment as a minority shareholder. If I was to "trade" FB, I would use long-term options (6 months to a year out) bull spreads and roll them as needed if I continued to think the trade made sense. A risk limiting trading strategy (yes, I know options are risky and not for everyone, so this is not trading advice) that has worked for me on risky tech companies in the past. But that's a separate discussion from FB as an investment and the valuation of FB. 1) The second class minority shareholder structure. Reminds me of many Canadian and Russian companies. Too often, the minority shareholders never realize the full potential value of their shares, even if the company does well. At least near-term until there is a clearer picture of a profitable business plan and cash flow to justify the valuation, the shareholder structure is a deal breaker for myself anyway. 2) As much as I try, I have never understood the fascination with FB. And the fact that it's popular with the Wall street sell side crowd, makes me wary. The way the IPO was handled and promoted via the media was a classic set-up. Any institutional investor that bought in at the IPO price obviously did not do their homework(or just believed the forecasts the sell side fed them) and deserved to lose their money. Google and their social network platform (Google+) makes more sense to me. I have spent extensive time going over the functionality of both FB and Google (which includes Google+). From a business use perspective, Google's range of products and the way they can integrate with their dominant search product makes more sense to me. I'll look forward to any valuation updates on FB if you decide to share them. Could you please clear this out for me. In your valuation spreadsheet of Facebook at the Valuation Output list where do you take into account the depreciation & amortization expenses and change in NWC while calculating FCFFs? I would highly appreciate the response. At least near-term until there is a better picture of a real strategic plan and income to rationalize the assessment, the investor framework is a deal buster for myself anyway. I am new to blogging, and I enjoyed reading your blog so much! It helped me get inspired to be consistent with it and you mentioned quite a few GREAT tips that I am going to apply in my future blogs. I really appreciate this information! Thanks for great post. I have a facebook fans page and I get more traffic for my site. So Facebook fans are most important for get more traffic for your web site and community. So buy facebook fans and enjoy your community. informatics Blog nice constant thanks. Facebook is becoming a very big platform. And every one is racing for Buy facebook Likes. Yo, an astonishing blog post buddy. Thank you However I am having issue with ur RSS feed. Fail to subscribe. Is there anyone getting similar rss feed trouble? Anybody who knows please respond. Thanks! There is a lot of hype about buying facebook fans where everyone seems to be so interested in buying the fans. Although, the fans are paramount in your business: helping you to build a brand and increasing your sales, you should not buy any facebok fans. To be on the safe side you should buy real facebook fans. If you want to buy facebook fans, you should note that there are two types of fans that you can buy: real and unreal facebook fans. Real fans are those obtained from people’s real accounts. On the other hand unreal fans are usually bot generated. Here the fans are computer generated and the accounts of these fans are usually inexistent. Although, unreal facebook fans will add more fans in your account, these fans are usually of no value to your business. This is because they are from unreal people thus the fans can’t buy or make your product popular. To ensure that you buy facebook fans that will be of value to your business, you should ensure that you buy them from reputable sites such as www.socialpluto.com . In addition to this, you should avoid buying facebook fans selling at extremely low prices. hello blogger,i really appreciate your highly thought about this matter through your post.Obviously your post is very informative. Groupon Gloom: Deal of the day or Death Spiral?